I recently went to the Legal Marketing Association’s (LMA) educational program, “Training the Trainers for Public Speaking Success” to gain knowledge on the tools, tips and techniques for preparing lawyers to give a presentation – whether it be at a bar association meeting, conference, webinar or another event. 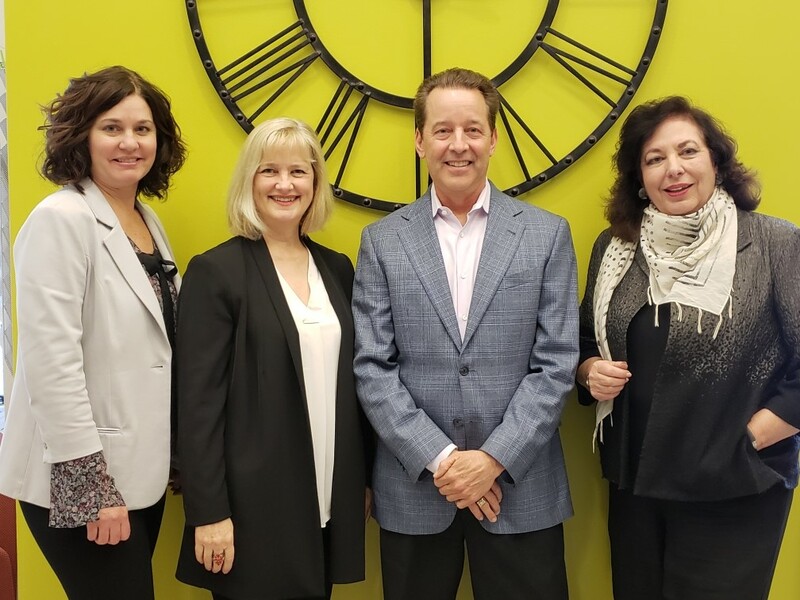 Moderated by our own Traci Stuart, the panel included public speaking experts’ David Adams, Founder, Revenue Wise; Marianne Fleischer, Founder, Fleischer Communications; and Doris Pickering, CEO, Silicon Valley Speaks. As marketers, we know that every speaking engagement is a potential business development opportunity; however, getting our clients to understand the intricacies of preparing a successful, revenue-generating talk can sometimes be challenging. Even the most experienced speaker has their quirks and bad habits, and presentation coaching can go a long way in getting the most out of an engagement – both personally and professionally. Focusing on engagement and brevity, a slide presentation must be in line (timing-wise) with what the presenter is saying. Once a slide is projected on the screen, the audience will immediately begin to read it and will likely tune out whatever is being said. Pickering mentioned that since members of the audience read at different levels and speeds, putting up slides with bullets, sub-bullets and sub-sub-bullets will make the presentation extremely difficult to follow. Instead, she suggested that slides should only highlight the key points and be used as visual aids. While keeping the presentation succinct is key to maintaining the audience’s attention, it will be useless without the right delivery. For any of us, it is important to know what we do when we are presenting. “Presenters should video themselves to point out a nervous tick and have something tangible to view in order to stop it,” she said. “If someone tells you that you are talking too fast, believe them! You have to be conscious of your speed, and practice speaking slower.” Fleischer added that an audience must hear the presenter and believe in what they are saying. Awareness is key and taking the time as a speaker to practice a presentation and its pace multiple times beforehand will help fight those habits. Nervous energy can also be identified and eliminated by the presenter by methods including walking on a stage or quietly grabbing the fingers of their fidgeting opposing hand to remain centered and calm. Ultimately, it all leads back to getting the business cards of audience members after the presentation is over. But how is this done? Adams mentioned that every presentation needs a great hook to start a dialog. Three go-to hooks to use are: 1) a scored worksheet/assessment; 2) a guide or whitepaper; and 3) a free or flat-fee service. Each of these can give the audience some incentive to pay attention or a reason for the presenter to reach out after the session concludes. As with anything in life, the more you do something, the better at it you become. Helping a speaker understand what worked and what can be improved on is critical to them wanting to present again and mastering the craft. Oftentimes, presenters focus too much on the negative and although they may say they don’t have the time to practice, it really is their job to do so. Pickering often tells clients to use their commute as a time to practice their presentations. In order to be totally comfortable on stage, especially if something does not go according to plan the day of, you must be totally prepared. This comes with repetition. Getting new clients is the end game and marketers need to drive the point home to them that speaking engagements are business development opportunities. Everything is permanent when posted on social media. Let me repeat that. Everything. Is. Permanent. We’ve all succumb to the temptation to drive likes, comments or retweets, writing off-the-cuff remarks for a following or to express oneself in a given moment. The problem is that those fleeting posts – some of which may have been written ten years ago when you were a snarky teen or college student – can come back to haunt you in your professional life. Recently, a variety of public figures – including high-profile entertainment executives (e.g., James Gunn, director of the “Guardians of the Galaxy” franchise) and athletes (e.g., Washington Nationals shortstop Trea Turner) alike – have become the target of internet trolls scouring through their accounts to dig up posts from years ago that contain insensitive and/or offensive language. While those with followings in the hundreds of thousands or millions make headlines when their old posts resurface, it is something that all professionals and their brand keepers need to be aware of – even if those posts do not become a discussion topic on CNN. While social media encapsulates our lives on a daily basis in 2018, we can forget that it has only been around in its current form for 15 years or so. The vast majority of us use it much differently today than we did in 2008, and while this isn’t an excuse for offensive posts, those posts are not always reflective of the person in the present. I can sit here and maintain that no one should ever post anything that could be deemed even mildly inappropriate; however, we are all humans that make mistakes. Every employed individual needs to understand that while speech is free, it is not free of potential consequences. Inappropriate behavior, even in the past, can hinder business development. For professional services companies, it is imperative to conduct a “social media audit” of employees to know what negative content may be lurking out there. Not all offensive content is created equal; however, most will not be as blatant as Gunn’s or Turner’s. Posts about politics, song lyrics, sports trash talk, among others commentary, may not be representative of the image a company wants to project. To really drive this message home, firms should host training sessions with the marketing department, HR department and general counsel. If they can get in front of the problem by emphasizing the importance of “scrubbing down” a social media account, while stressing individual First Amendment rights, they can put themselves in a better position to avoid a crisis in the future. In these sessions, they can counsel employees on proper social media use and the company standards for posting. Are certain topics off limits? What type of language is tolerated? Would they be comfortable with a client seeing this particular post? These are important questions for professional services companies to consider as social media isn’t going away anytime soon and the internet has a long tail – that can come back and smack you. As technology continues to evolve year after year, that tiny computer in your pocket adds more features and capabilities that make its originally intended use – talking on the phone – somewhat of nonessential. The amount of ways people communicate and access information on their phone are endless, and we live in a world where posting photos and videos of your life events are a form of communication in itself. With the advanced cameras included in today’s phones, we are far removed from the grainy, poorly lit and worthless images taken in the early to mid-2000s. Now we have access to high-definition photos and 4K videos that can be augmented with filters, lighting, colors, panorama, selfies and even VR. Long gone are the days where we need bulky professional camera equipment to get a professional looking and beautiful shot. In fact, Kanye West snapped a picture with his iPhone that became the album art for his recently released 8th studio album, Ye. Inspiration can strike at any moment, and for Mr. West, it happened to strike on the way to his album listening party when he saw a beautiful mountain range in Wyoming. The camera in our pocket is continually improving and is always right at hand when the mood strikes. Are you hosting an event? Has the company received an award? Do you want to show off your new office digs? There are so many reasons to take a picture and now, more than ever, you can do so with the high-quality technology that shows your company in the best light. Memory is abundant and bad photos can be deleted with one click. There is no cost to becoming a shutterbug. This is especially apparent when taking group photos. If one person doesn’t look quite right, it can throw the entire picture off. By taking multiple photos, it increases your chances of getting a shot that everyone is happy with in the end. Professional photos are wonderful, but expensive and require advance preparation. Supplement them with phone images. Given the amount of equipment and prep that goes into hiring a professional photographer, sometimes they don’t always capture the essence of the company or an event that you are hosting. Those photos can appear forced or stale. Getting candid photos with your phone show the personality of the company and its employees. Stop taking pictures of tables! Be creative. Kanye featured mountains – at least zoom past the ubiquitous white tablecloths at events and frame your shots. The more variety there is in your photos, the more likely your social media followers will look at and “like” them. Photos feed social media feeds, outtakes and extras now have a home and can enrich your channels. Back to the whole concept of “more is better,” take video, candids and funny photos to give your social media pages life and showoff company culture. Since its launch in 2010, Instagram has steadily emerged as a powerful tool in content marketing. User-generated visuals without the need for a timeline structure has elevated the social media platform as a foundational way for businesses to connect and communicate with existing and future clients. The photo-centric medium lends itself perfectly to the visual nature of the design industry; however, many AEC firms are still hesitant to embrace Instagram as a marketing model. Here are a few reasons AEC firms should consider adding Instagram to their social media arsenal. People love to see what goes on “behind the scenes” of a project, and sometimes, work-in-progress is just as interesting, if not more so, than the final product. Show your followers the steps it takes to get to completion. Sketches, milestone events and day-to-day activity are all great ways to keep viewers engaged and put your project’s progress on display. It’s easy to get caught up in the beautiful imagery of projects but don’t forget about your employees. Posting personnel photos provide past, current and future clients insight into company culture and values. Photos of meetings can suggest collaborative work efforts and thought processes. Field trips to product suppliers and industry events demonstrate professional development. Team party photos humanize your firm and tell the world that your office is a fun place to work – a recruiting bonus. Hashtags help users discover content and accounts to follow. The right hashtag, or combination of hashtags, will expose your brand to large and targeted audiences. By becoming more discoverable, there is a better chance of attracting new followers, getting more likes and increasing engagement. Tagging allows you to elevate the profiles of clients, partners and influencers, while also gaining followers of your own account. With a tag callout, the person or brand will be much more likely to comment or like your post, which increases engagement on both sides. Tagging also means that your photo will show up on the other individual’s or brand’s “Photos of You” section on their profile, expanding your reach to their followers. You don’t always have to share photos of your own firm’s work. If you find a building or detail interesting, share a photo and let followers now why you like it. Share list of the “must read” articles for the week. Encourage followers to support a cause that’s important to your firm. Creating and populating an Instagram account can feel daunting or seem like just “one more thing to do,” but failing to do so keeps your pictures – and projects and people – from saying thousands of words. With a little planning and perseverance, Instagram can be a great complement to other content marketing and business development efforts. Blattel Communications Founder and CEO Ellen Blattel recently sat down with Account Executive Vicky Jay and discussed the value of writing as a marketing and communications tool as part of our “Conversations with Ellen” series. Vicky Jay (VJ): If you are a partner at a busy law firm, how can you find time to write? Should you look to tap associates as co-authors? Ellen Blattel (EB): Absolutely tap associates as co-authors! Not only does it support a partner with limited time in developing content, but it elevates the associate, particularly if the partner is willing to include the associate’s name on the byline too. Additionally, engaging associates in article development demonstrates their significance to the firm, allows them insight into the firm’s business development processes, and reinforces the importance of using marketing tools for business generation. VJ: Are practice group blogs mutually beneficial to byline article writing? EB: All content development is beneficial, but professionals must be strategic – evaluate your target audience and determine how they prefer to receive information, then deliver. Generally, bylines in trade publications (print or online) are educational and offer credibility and visibility that can lead to new business. Depending on the practice area, maintaining a blog and/or contributing to leading blogs in the space can also drive leads. In all cases, blog postings and byline articles should be leveraged to support each other – byline content can often be placed on a blog, and conversely, blogs can lead to opportunities for byline article publishing. VJ: What’s the best process for developing articles for publication? EB: Again, upfront strategy is critical. Work backwards. First, identify your target audience. Who are you trying to reach? Where do they fit within their organizations – C-level executives, managers or in-house attorneys? What industry are they in? Then, consider what’s keeping those potential clients up at night. Answering these questions will help determine topics on which you might write and potential outlets for the article. The topic should then be preplaced, based on a short synopsis of the article, to ensure there is interest and to secure all author guidelines. After this is completed, the article can be written and edited – specifically (and strategically) for the desired audience/outlet. VJ: Once a byline article is published, how can it be leveraged? EB: The content should be leveraged on firm bios, LinkedIn profiles, blogs, e-newsletters and other social media channels. When really applying strategy, we’ll look at an attorney’s target clients and see what topics resonate. From there published articles can and should be shared with potential and existing clients and referral sources – ideally with a personalized note that offers insight into why the article is pertinent to the recipient. VJ: Do you ever advise a client – looking to market themselves but struggling to write – to choose an alternate vehicle? EB: It depends on the client. If there’s existing content that has been developed for other purposes, such as speaking engagement outlines, we’ll recommend using that as a starting point to help get the creative juices flowing. If an author is still having trouble approaching the subject or relevant content isn’t available, a “Top 10 Tips” angle is a great way to go. The most common challenge tends to be timing. If that’s the case, and we feel like an article is an important business development tool, we’ll work with the author to get to a rough draft that we can then edit and finalize. We’ve also set up interviews to discuss a topic and ghostwrite content. Because we see such a strong correlation between content and new business, we try to help our clients overcome any adversity to writing (maybe a podcast!?!). Ellen Blattel, as told to Vicky Jay. If professional services firms really care about their content readers and their long-term value proposition to them, I urge them to consider this concept: Slow News. This is content that has taken time to develop, that has depth and is written in a precise and forward-looking manner. After its creation, it is disseminated in a broad, but strategic, manner. Necessarily, this means the professional services firm might not be first-out-of-the-gate when a development occurs. But, if done correctly, this approach yields an article, blog post or newsletter column that is sought out versus being the first to landing in the in-box. A long-term content backlash is brewing, similar to the trajectory of processed food manufacturers’ fortunes and reputations in the face of the “Slow Food” movement. What made their products so tantalizing – salt, sugar, fat and preservatives making for long shelf-lives – are also their undoing. Consumers are increasingly shunning these “middle of the grocery store” options in favor of fresh fruits, vegetables and other products that are better for them. The analogy is clear: nutritionally minimal/devoid processed food is like the vacuous content dominating social media. It may offer quick, immediate satisfaction, but you will be hungry soon after. Part of my impetus for this post was an interesting piece in the New York Times by tech scribe Farhad Manjoo titled, “For Two Months, I Got My News From Print Newspapers. Here’s What I Learned.” Manjoo had three takeaways for readers interested in a better, less distracting news experience: 1) Get news; 2) Not too quickly; and 3) Avoid social. Adapted for professional services providers, here are my mantras: 1) Create content; 2) Take your time; 3) Use, but don’t worship, social. This seems somehwat self-evident; but, the number of missed opportunities to promote event participation, update biographies and LinkedIn accounts, author byline articles and comment as an expert are myriad. As professional services firms rise and fall on the knowledge and thought leadership evidenced around the service they provide, content creation needs to be consistent, timely and organization-wide, with a focus on producing multiple touch points from a single activity. Communications professionals are often called in after an event of significance has happened, sometimes months later, and asked what can be done. The simple answer: not much. Similarily, when a major piece of legislation passes or a case decision is announced, the window for comment opens and closes in a matter of hours. Days, weeks and months later, the news has moved on and the bar to pique a journalist’s (or potential client’s) interest is much, much higher – and as such, the content output must be that much more thoughtful. It’s an interesting time for social media as its ubiquity makes one wonder if a generational backlash is looming. Just as we saw with successive generations of eaters abandoning processed foods, trends tend to go heavy in one direction and then swing to a middle-ground. Long-form, subscription news sites, like the sports-focused The Athletic, and growing newsrooms at venerable publications, like The Atlantic, would seem to defy the suggested trend toward less text and more video. For professional services, if content isn’t a) high-quality, and b) a true value add, then don’t make it and don’t promote it. It really is that simple. Ultimately, when a fiscal belt tightening occurs, the spend on chasing clicks without an underlying and clearly defined revenue-driving purpose will not survive. 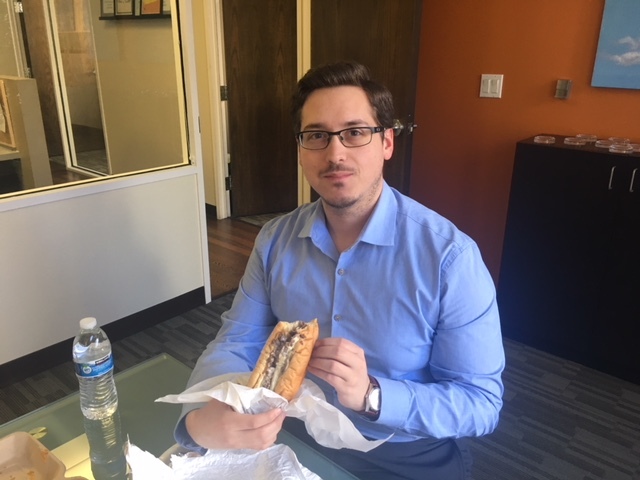 Blattel Communications’ Michael Panelli makes good on his wager with colleague Michael Bond and chows down on a cheesesteak. Traci Stuart – I’m giving the win to Tide on this one! Way to “go big or go home” with the game day ad! We always say repetition is the key to successful advertising, and Proctor & Gamble definitely nailed it on consistency – to the point where folks expected Tide to pop up in many of the other brands’ spots. The series had it all, including throwbacks to iconic ads of the past; social media tie-ins (#thisisatidead) with celebrity comments (@terrybradshaw and @bettymwhite); and a big ol’ nod to a pop culture phenomenon with a family friendly (and probably slightly more affordable) celeb in David Harbour from Netflix original #strangerthings. And, nobody needed to change the digital and water cooler conversation quite like Tide given that teens have been eating and meme-ing the company’s colorful Tide Pods. I’ve also got to give a hat tip to NBC for the promo and timing of “the big Jack episode” of This Is Us. Super Bowl tie-in, emotional tug of a quintessential “dad moment,” and clever foreshadowing of the post-Super Bowl, janky-Crock-Pot, Jack-doomsday apocalypse. Michael Panelli – Danny McBride starring in a fake trailer for a new Crocodile Dundee movie? What’s not to like? Too bad it’s not a real trailer. It was a different type of Super Bowl ad; it actually made viewers believe a new movie was in development! (The “movie” actually had an entire pre-Super Bowl campaign, adding to the wonder about a “real” project.) Using a fake movie trailer to get people’s attention – for visiting Australia – was novel. Joey Telucci – The clear winners of the Super Bowl (besides the Eagles) were obviously Eli Manning and Odell Beckham, Jr. Their interpretation of the Dirty Dancing “(I’ve Had) The Time of My Life” routine was legendary and would make Patrick Swayze proud. It was definitely my favorite of the night and got the most laughs from the group I was with. Too bad it was just an NFL commercial: it would have been a great pitch for any number of products. Kudos, NFL. Kudos. Close second was seeing Danny DeVito (AKA Frank Reynolds from It’s Always Sunny in Philadelphia) portray an M&M. Classic Frank (if you watch the show). Blattel Communications’ Ellen Blattel, Penny Desatnik and Vicky Jay also picked this spot as their favorite. Michael Bond – Joey Telucci’s silver-medalist is my gold-medalist. The evolution, or devolution, of Danny DeVito with his role on Always Sunny is fun to watch and the M&Ms ad shows that he is a good sport about his physical stature, or lack thereof. For a classic comedic actor to be so uninhibited is refreshing, and the spot evoked a delighted comment, “Of course, HE’s the M&M!” from one of my viewers. Candy is one of those categories, and M+Ms as a product in particular, where I’m not sure if ads really move the needle in terms of sales. M&Ms are iconic, delicious and without a real substitute. Still, the brand’s campaigns are consistently witty. Shifting gears, I also really liked the Budweiser disaster relief spot. Regardless of one’s opinion on its suds, the company consistently cans and supplies out much-needed water to communities affected by natural disasters. Every time they do so, great press ensues with images of pallets and pallets of water enjoying print and airtime. While I’m a perpetual cynic*, I do think this is a move spurred by doing good first rather than by getting good press.